My favorite time of year is autumn. I love when the air turns cool and the shadows lengthen. After a long, hot summer it is a welcome reprieve. The colors and flavors of fall are among my favorites as well. From golden yellows and showy reds in the leaves to the rich oranges of pumpkins, the changing colors announce the harvest and the time to prepare the earth for rest. As a child, I remember my mother always brought home bushels of crisp, shiny apples from a farm nearby. We would delight in the first apple pie of the season – my mom’s specialty. Her crust was the flakiest in the entire world and the scent of cinnamon filled the kitchen. I grew to love the warm spices of fall recipes; cinnamon, nutmeg, allspice, ginger and clove. To this day, they evoke fond memories of hearty meals, fruity desserts, and autumn activities. Nothing declares fall like a bright orange pumpkin. As an adult, I have discovered the wonders of cooking with pumpkin — pumpkin cakes, cookies, muffins, pies, and even soups. The flesh of this humble squash is rich in vitamin A, anti-oxidants such as lutein and zeaxanthin, and carotene, all beneficial nutrients for eye health. It is low in calories and high in fiber. Pumpkin is versatile, nutritious and lends moisture to any recipe. 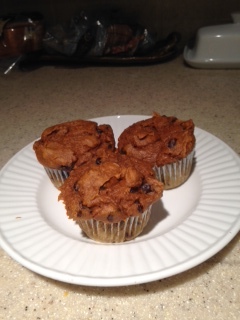 On a chilly morning, there is nothing quite as heavenly as a pumpkin spice muffin, one of my family’s favorites. I used to bake everything from scratch when my kids were young and my vision was better. I was opposed to using mixes and pre-prepared foods as a matter of principle. But over the years, I have given up this high moral standard as a matter of convenience and efficiency. I enjoyed cooking more when I had the vision and a hungry family to feed. Now, I am happy when I find “easy” recipes that are as good as “homemade” and feature nutritious ingredients. For those of you who still want to bake but your vision limits you in the kitchen, I share this simple and delicious recipe. Stir above ingredients until well mixed. Fill a greased muffin tin and bake at 350 degrees for 20-25 minutes. Makes 12 large muffins. I hope you enjoy the yummy flavors, aromas and colors of autumn. Make it a time to slow down, smell the spices, and be grateful for the harvest of blessings in your life. This entry was posted in Blog Topics, Uncategorized and tagged cooking with low vision, eye health, pumpkin, Pumpkin Spice Muffins. Bookmark the permalink.